To save a few dollars, I put myself on the waiting list for a certified pre-owned BumGenius 4.0 Pocket Diaper from Diaper Junction. They have a 30-day trial program at their store, so every so often they’ll have pre-owned diapers in excellent condition for sale. After a few weeks on the list, I received an email saying they had several. I ordered one online in the “clementine” color with snaps and picked it up in store. A single BumGenius 4.0 retails for $17.95 at Diaper Junction, so they’re on the higher end of the pocket price range, but not as much as the Rumparooz One Size Pocket Diaper (my current favorite pocket). There’s currently a sale on BumGenius 4.0 pocket diapers: Buy 5, get 1 free. I’m not sure how much longer the sale is going on (I’ve heard just a few more days), so if you’re interested in owning several, I wouldn’t wait too long! This pre-owned diaper looks new. The only part of it that looked like it had some use were the inserts. They weren’t stained; they just looked as if they’d been washed a few times. The 4.0 is a one-size diaper. This means that by utilizing the three rows of snaps on the front of the diaper, you can adjust the rise. According to the BumGenius Web site, this diaper fits approximately 7-35+ pounds, meaning you can use the same diaper on your newborn all the way to potty training. The outside of this diaper is made of a waterproof material. It feels like TPU, but I was unable to find any information online stating exactly what it is. I have heard that they use PUL. The one-size insert can be adjusted to a medium or small size from large by folding the end over and snapping it down. 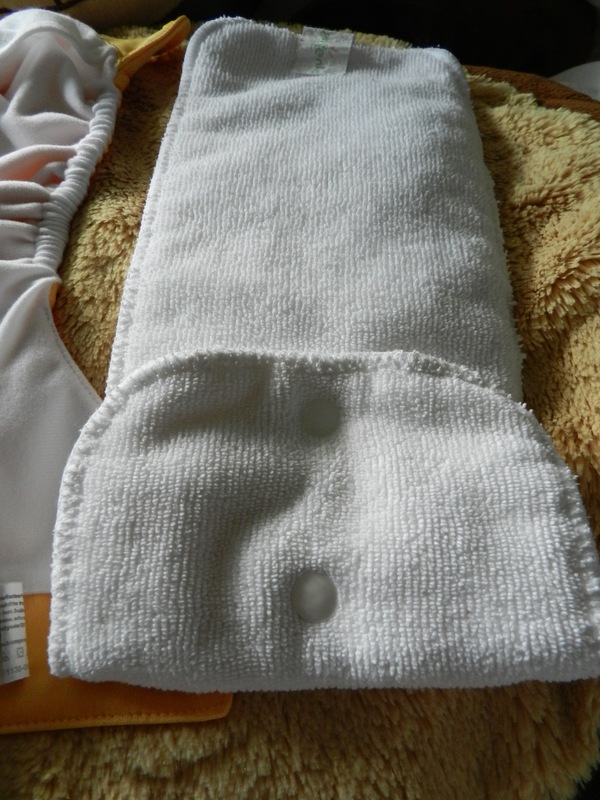 A separate insert, for newborns, can be added to the adjustable insert as a doubler for increased absorbency. 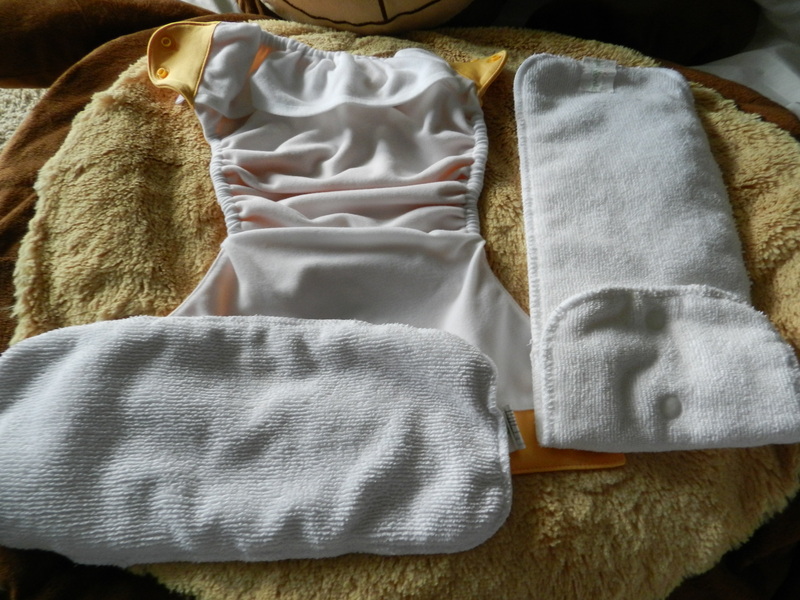 The pocket opens in the back and is quite wide, allowing larger hands to stuff the insert in the diaper. It has a large flap to cover the opening. There’s also another smaller flap inside to help the insert stay in place. 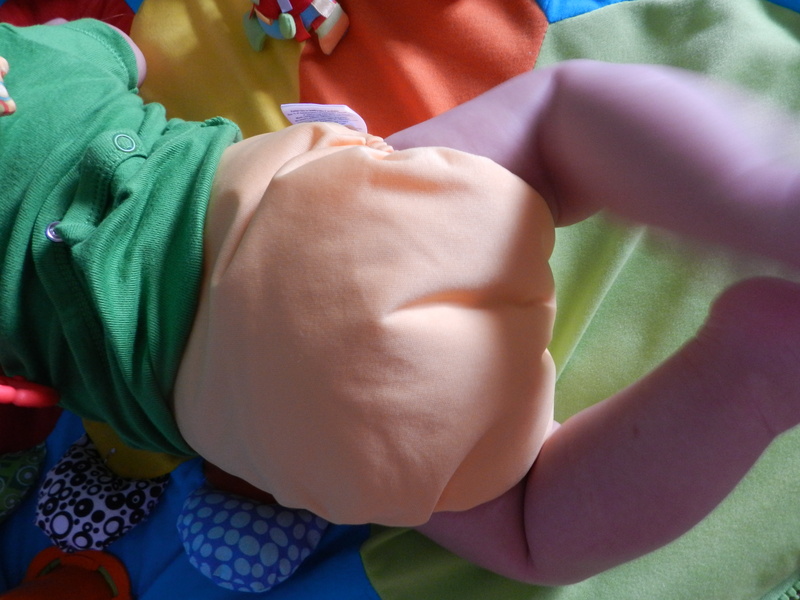 There is elastic at the back and legs, and it’s replaceable, so this diaper can last for multiple children! 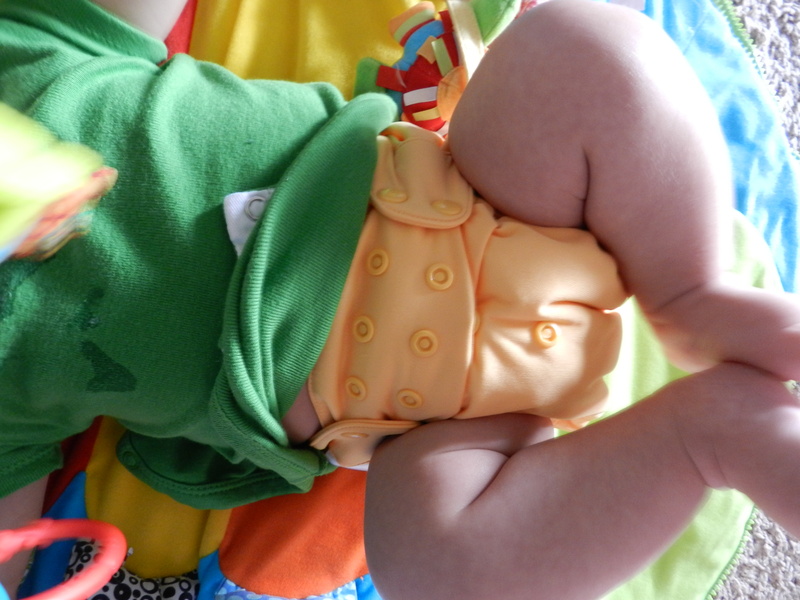 This pocket diaper’s soft, sueded inner fabric wicks moisture away from my son’s skin. Like the BumGenius All-In-One that I own, this diaper is quite wide between the legs. It’s fine for my son (he’s large for his age), but I could see this being extremely bulky on a newborn or a small infant. I can see this diaper fitting him through potty training. I’ve washed this diaper a few times now, and it’s holding up well. My son has worn it for 3 hours straight with the medium insert and no problems with leaks. To be honest, I don’t understand why there’s such a hype over these diapers. It does the job, but so do certain cheaper diapers, so I’m glad I got the pre-owned. But it is a good, solid, well-made pocket diaper. Over time, I’ve reconsidered the above statement that I’ve now crossed out. I’ve heard from numerous mothers who’ve used the same BumGenius diapers over and over for several years that they hold up very well with constant washing…better than most diapers. Also, the flaps to hold the insert in place and then cover the pocket opening are just a nice feature that I haven’t found with any other pocket diaper. By the way, as of today, Diaper Junction still had 2 certified pre-owned BumGenius 4.0 diapers available at $14.37 each, and that’s a good deal! Note: These opinions are my own and may differ from yours. I was not compensated for this review; I purchased the above item. This post contains affiliate links. Nice review! 🙂 Pocket diapers seem like a lot more steps, or “work” to assemble to me than the ones I have. I use Econobums (bought from Toyr R Us.com) and the design is basically the same as these from the outside, and then on the inside you put a prefold. I just don’t get pocket diapers. Are they much more absorbent do you think? Thanks! 🙂 I wouldn’t say they’re necessarily more absorbent. But it’s easy to add extra inserts in the pocket. The draw for me that pocket diapers have is they wick moisture away from my baby’s skin better than any of his other diapers. When he starts to potty train, then I’ll probably want him to feel wet, but when he’s so young, I just like him being dry. The microfiber inserts in his pocket diapers can hold A LOT of pee and still keep his bum dry. Tha’s cool. 🙂 I have found that if I slip a strip of fleece in Sam’s diaper, on the prefold, that it helps cut down on moisture, and I also powder his bum with cornstarch and that works WONDERS at keeping him dry! I don’t use powder, but fleece is great! I cut up an old fleece blanket, and I like to lay a strip of fleece over top a microfiber insert for extra absorbency + moisture wicking. Thanks for the review! I’ve been looking forward to reading it! Does the lack of leg gussets affect how your BGs fit and hold messes? I have 2 of the BG AIO Elementals, and I definitely think they could be improved with gussets. But BGs are so popular that I wonder whether I’m missing something. As you said, I’m not sure why all the hype. I do like my organic BG Elementals, but they’re not my favorites. Like Valerie, I’m curious to hear your opinion on pocket diapers in general. They are extremely popular, but I can’t figure out why: they’re more work than an all-in-one, but unlike non-pocket covers, you can’t reuse the cover even if the diaper is just wet, meaning that the cost goes much higher since you have to buy a cover for every diaper change. What’s the advantage to pockets?? I’ve heard that it’s “you can adjust the absorbency with the inserts” but that can be said of any diaper . . .
I’ve been wanting to try out a few pockets to see if I will fall in love with them as everyone else seems to do, but maybe you can help me get started with knowing what makes them so popular. 😉 Maybe you could do a post just on pocket diapers some time? Sure! I’ll work on a pocket diaper post. Like I told Valerie, the primary draw for me is the moisture-wicking capability. Yes, you can do tricks for other diapers (like prefolds), but in my opinion…the pocket is just better at wicking moisture and baby will be drier. As far as gussets, I actually have very few diapers with gussets. I have two Rumparooz pocket diapers, and they both have inner gussets. I’ve been waiting to see how well they hold in poo (it’s supposed to be great), but go figure, Mr. Stinky Pants NEVER poops in them. Then I have 3 covers with gussets. Yes, they do hold in poo well. But my regular diapers without gussets also do a much better job at holding in a mess than a disposable does. There have been a few times when my boy was wearing a cheaper-brand pocket diaper without gussets, and he pooped so much it was ALMOST starting to come out the legs, but I changed him as soon as I realized it, and he was fine. He hasn’t blown out over any clothes. Which in disposables, he did ALL the time! By the way, I don’t have the BG AIO Elemental, but I do have the BG AIO Freetime, and I’ll get to a review on that at some point. My goal is to add at least a couple reviews every a week…but there’s my goal, and then there’s reality, hahah!